my head and wondering what went wrong. Here are the things I used for this project. Here is what I was trying to create…..
on how to make them. I am sure her directions are right but somehow I managed to screw this up. again. The next day just a few crystals have formed. Five days later this is all I got! Steve tried to ease my pain by saying “maybe it’s the water here”…yeah right. Dad said “it was just a family curse”. That’s it for my one project this Christmas! I hope your holidays are filled with love and happiness…. LOL! I like the way your dad thinks! That is such a shame, Sherry! Maybe if you e-mail her she can help figure out what happened??? Wishing you a Merry Christmas!!! Perhaps, the base flake you're starting with is too smooth to allow the crystals to stick? This usually works well with pipe cleaners, because they're rough and give the crystals something to attach to… Maybe find a different type of base flake and try again? Oh that's a bummer! I wish I knew how it was done to help you. Sorry you didn't get the pretty snowflakes you were hoping for! And you know we've all had fails along the way! Well, at least you TRIED! What a shame that this didn't work out, Sherry. 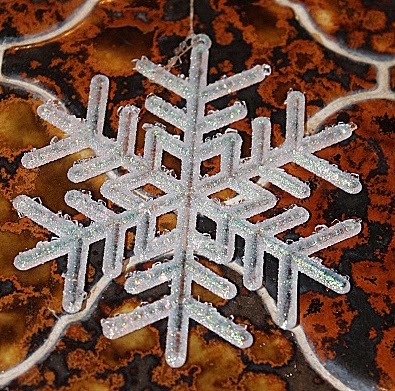 I looked at the tutorial and she says that because of the fine tinsel threads on the plastic snowflakes the crystals grew so big. I don't know but maybe that made the difference? Have a great week and hopefully the next project will work out better. Awww…I'm so sorry. 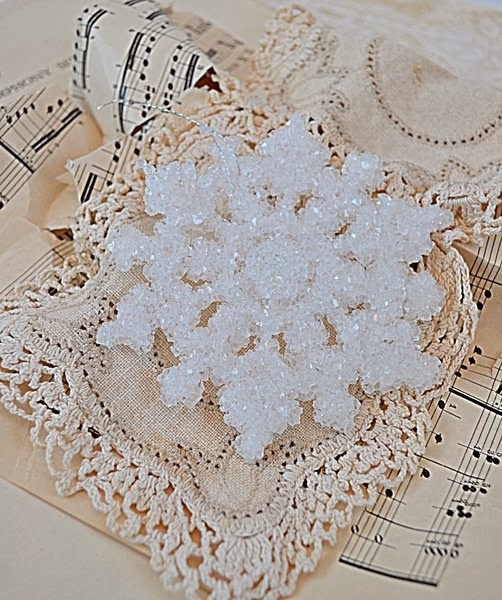 We had good results using crocheted snowflakes (cotton thread). The plastic kind didn't work for us because they contained some nylon. Also, on our first try we didn't get crystals because we didn't get to the saturation point of our water…very important. Do you have a water softener? I wonder if that might make a difference? One of the other comments was right the surface need to shave some tooth. 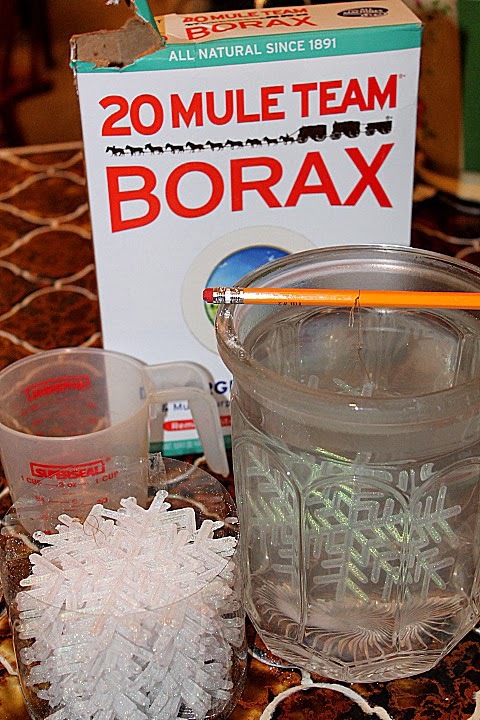 Also I've always done it with Epsom Salts and the same technique. Pipe cleaners and styrofoam work great. I did a snowman with 3 styrofoam balls. Hope this helps. Sherry, that sounds like one of my attempted projects-lol! Oh, well, at least you tried! It looks like Jen, above, has some knowledge on this. I would have tended to blame it on the FL water too! I have had lots of Pinterest failures, recipe wise…so I have gotten a lot pickier and do more research before trying. Usually if it's on Pinterest once, others have their versions, have you tried cross referencing to check the method? It could well be the chemical make up in the water~ Too bad, I love what you were trying to achieve! She did say that the snowflakes need some texture like hers with the tinsil and the other covered in glitter. Your's look real smooth, but I can't tell for sure from the photo. They are so pretty It makes me want to try it too, but I'm afraid it would be a waist of time. Hi. I would bet that the problem is what others have said, either your snowflakes were too smooth or, my personal favorite, your water has a different chemical make-up from the original maker. We are on an artisan well and I know that the taste of the town's water doesn't even compare to our water, and we don't even have a filter! (Don't need one, lots of good filtering rock under us apparently.) I also noticed a difference in how I need to clean the tub and sink from when I lived in town, so I know that there are different things in my water now. I'm almost positive that is a big part of your problem. Try it with distilled water and see if you get the same result.